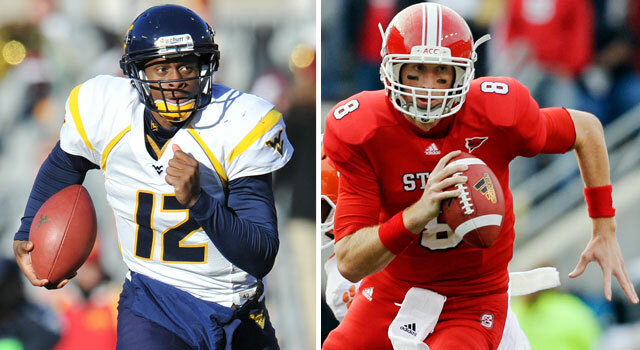 West Virginia's Geno Smith (left) is the top QB on most draft boards, but N.C. State's Mike Glennon is rising. Late-December bowl games provide NFL scouts with several opportunities to see top prospects duke it out in competitive games on big stages. Although these performances are only viewed as a small piece of the evaluation puzzle, scouts certainly pay close attention to how the prospects play because it provides a preview of how they will perform at the next level against elite competition. Given that premise, here are some of the guys I will be watching over the next few days to see how they stack up against legit opposition. Khaseem Greene, OLB, Rutgers: After transitioning from the safety position prior to the 2011 season, Greene has evolved into one of college football's top linebackers as a senior. He is a tackling machine with exceptional instincts, awareness and production. While some question Greene's size (6-foot-1, 239 pounds) and physicality against lead blockers, the fact that he has racked up 10-plus tackles in seven games suggests that he has a knack for getting to the ball, despite his slender frame. Facing a Virginia Tech squad that prefers smashmouth football over a finesse approach, Greene has another opportunity to show scouts that he has what it takes to be a difference maker at the next level. Logan Thomas*, QB, Virginia Tech: Thomas entered the season as one of the top quarterbacks in college football. However, the Virginia Tech signal-caller failed to play up to expectations for most of his redshirt junior season, and scouts are wondering if he really has the goods to be a franchise player at the next level. Although he possesses some blue-chip traits, such as his superior size (6-6, 260), speed and arm talent, Thomas has been inconsistent; it's imperative that he put on a show against the Scarlet Knights to build positive momentum. How well he fares in this showcase could have a significant impact on his stock. Geno Smith, QB, West Virginia: Smith has surpassed USC's Matt Barkley as the top quarterback prospect in the 2013 draft class on most boards, based on his spectacular play as a senior. He completed more than 71 percent of his passes with a jaw-dropping 40:6 touchdown-to-interception ratio. Most importantly, Smith displayed superb arm strength, accuracy and anticipation while directing a Mountaineers spread offense that lit up scoreboards across the Big 12. With another game left to solidify his status as the top signal-caller in the forthcoming draft, Smith must show scouts that his game fits traditional pro-style systems, while also displaying the awareness and savvy to overcome some of the defensive tactics that seemingly gave him problems at the end of the season. Tavon Austin and Stedman Bailey*, WR, West Virginia: It is hard to find a better pass-catching duo than Austin and Bailey. This Mountaineer tandem combined to tally 226 receptions for 2,760 yards and 35 touchdowns in 2012. Austin, who also rushed for 598 yards, is an electric playmaker with speed and quickness. He excels at turning short passes into huge gains, which has scouts comparing him to Minnesota Vikings receiver Percy Harvin. Bailey also has been lauded in the scouting community for his outstanding ball skills and route-running ability. Although he isn't considered a blazer, Bailey's ability to get open consistently against top corners has piqued the interest of NFL evaluators. Ryan Nassib, QB, Syracuse: In a draft filled with question marks at the quarterback position, Nassib has emerged as a viable option for NFL teams seeking a quality starter with an outstanding feel for directing a pro-style system. He has shown exceptional arm strength, accuracy and anticipation, but scouts still harbor concerns about whether his game is the byproduct of the Orange's system or a true reflection of his talent. With an opportunity to work against one of the worst defenses in college football, Nassib might put together a blockbuster performance that silences doubters and enhances his draft prospects on boards across the league. Alex Okafor, DE, Texas: Okafor is one of the top defensive ends in the 2013 draft class, shining against Big 12 competition with his explosive combination of size, strength and power. Okafor finished the season with eight sacks and numerous pressures, displaying solid rush moves that make him an intriguing option for teams looking to improve the pass rush. Some scouts have been unimpressed with Okafor's inconsistent motor and hustle, giving him a "boom-or-bust" label, but his unique combination of skills could make him a high pick. Kenny Vaccaro, S, Texas: The changing nature of the NFL game makes it imperative for defenses to feature safeties with the ability to hit, run and cover. 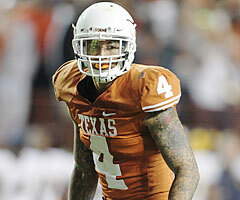 Vaccaro showcased those traits throughout 2012 as a safety/nickel back for the Longhorns. He is a factor in the box against the run, but also displays the ability to cover tight ends and slot receivers in space. Facing an Oregon State receiving corps that features several dynamic options -- including Markus Wheaton and Brandin Cooks -- Vaccaro's cover skills will be put to the test in the Alamo Bowl. Jordan Poyer, CB, Oregon State: Poyer has quietly developed into one of the top cover corners in college football. He is an instinctive playmaker with fantastic ball skills. Most importantly, Poyer displays the ability to lock down receivers on the perimeter or in the slot as a nickel defender. With seven interceptions in only 11 games, Poyer has entered the conversation as a potential second-round pick, but scouts still question whether he has the speed and athleticism to cover elite receivers at the next level. Against a Longhorns squad that features a few athletic pass catchers, Poyer will have a chance to address his naysayers in his final collegiate performance. Mike Glennon, QB, N.C. State: Glennon has steadily climbed up the charts during a strong senior campaign. 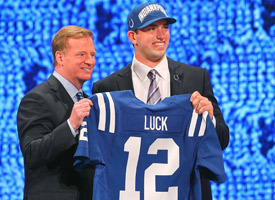 He completed more than 57 percent of his passes for 3,648 yards with 30 touchdowns against 14 interceptions. While some point to his underwhelming completion percentage as a reflection of Glennon's inconsistent accuracy, the senior is playing with an inexperienced receiving corps that has struggled to hold on to the ball for most of the season. Given another opportunity to display his talent on a big stage, Glennon can prove to NFL scouts that his game is pro-ready and his natural talent is unrivaled at the position. If Glennon puts on a strong performance in the Music City Bowl, he could see his stock continue to rise until he's a possible consideration on Day 1. 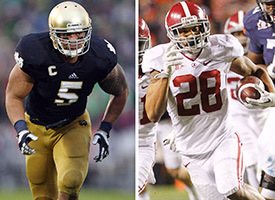 Take a look at the draft prospects to watch in each college bowl game. David Amerson*, CB, N.C. State: Amerson suffered through an up-and-down 2012 campaign, but the junior is still viewed as one of the best defensive playmakers in college football. He has tallied an incredible 18 interceptions over the past two seasons, while showcasing remarkable hands, instincts and awareness. However, scouts have concerns about his speed and man-to-man cover skills after watching several receivers run past him on deep routes. To alleviate those concerns, Amerson must show sound technique and skill against the Commodores, while continuing to make plays on the ball. Robert Woods*, WR, USC: There is no doubt that Woods is one of the most complete receivers in college football. He is a polished pass catcher with the size, speed and skill to thrive as a No. 1 receiver at the next level. While his statistical output has declined with the emergence of the ultra-explosive Marqise Lee, Woods is still held in high regard in the NFL scouting community. In what could be Woods' final performance as a collegian (he is expected to declare his intentions following the game), he can show evaluators that he is capable of being a top option for an offense seeking an anchor in the passing game. Barkevious Mingo* and Sam Montgomery*, DE, LSU: The Tigers' pass-rushing tandem is unquestionably one of the most talented duos in college football. Mingo and Montgomery terrorize opponents with speed, quickness and athleticism off the edges. Both have shown the capacity to take over games, but scouts would like to see each player dominate consistently as an edge rusher. Facing a high-powered Clemson team led by a dangerous quarterback (Tajh Boyd), Mingo and Montgomery must show scouts they are capable of wreaking havoc on a big stage. How they fare in this New Year's Eve clash could significantly impact their draft values, should either decide to enter April's event. DeAndre Hopkins*, WR, Clemson: Hopkins lived in Sammy Watkins' shadow last season, but he emerged as the Tigers' top playmaker in the passing game in 2012. Hopkins snagged 69 passes for 1,214 yards and 16 touchdowns, while displaying exceptional speed and explosiveness on the perimeter. Although he hasn't declared his intention to enter the 2013 draft, Hopkins has shown enough playmaking ability to make some noise at the next level. With a big performance against a talented LSU secondary, he will cement his status as one of the top playmakers in college football. 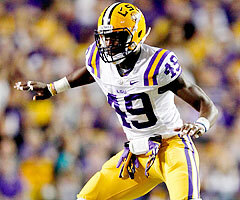 Andre Ellington, RB, Clemson: Ellington is arguably the top senior running back in the 2013 class. He is a speedster with outstanding burst, quickness and home-run ability. Ellington excels on the perimeter, but has shown more grit between the tackles as a senior. This has raised his value in the minds of scouts, but questions persist about his size (5-9, 190), toughness and durability. Facing a big, physical LSU front seven, Ellington can prove to evaluators that he has the capacity to grind it out against a rugged squad. If he can show a willingness to pick up the tough, three- and four-yard gains, Ellington can erase some doubts and creep into the conversation as a Day 2 selection.